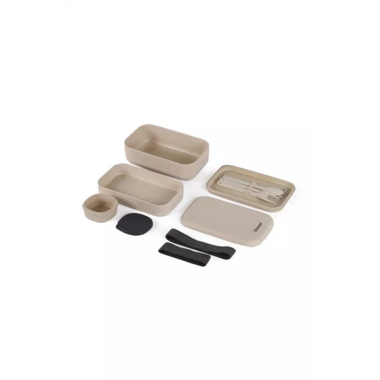 Enjoy a delicious lunch eating from the Minimal Brand Dual Bento Box, the most eco-friendly natural fiber food container, made from discarded rice husk material which is a byproduct of rice production, a renewable and sustainable resource. 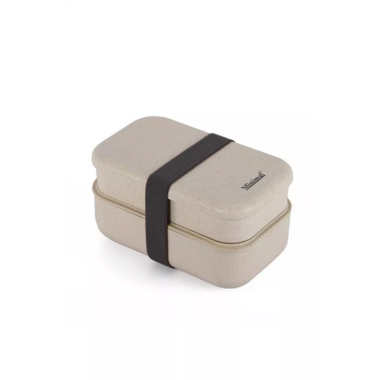 The containers are stackable and expand creating two separate leak-proof food compartments within the Dual Bento Box. While strong and durable, the material will last years. In time, simply recycle or when covered with soil, the natural fibre components will begin to biodegrade into biomass in 120 days! I wish I found it earlier - love the design! Well made! I raved about their other single lunchbox, and I can't rave about this enough either. I bought both lunchboxes cause they're absolutely amazing. This one is also beautifully designed like the other one. The renewable cutlery is amazing, I use it for lunch every day. There's a steam vent in the middle tier, and a slit for the bottom container to divide food up. Amazing, clean design. Best lunch box you can own. I love this bento box! I can't believe it's made out of rice husks, so sustainable! I used to bring tons of tupperware to work. Now I can just separate up my food (salad on top, pasta on the bottom for example). I also love that the cutlery is easily transportable. I'm so impressed with the overall niftiness of it - all parts fit together seamlessly, it's microwaveable, and even has a little sauce cup for my salad dressing, etc. Doesn't leak at all in my bag, even when turned upside down! Lastly, I usually pack big lunches but somehow the portion size of this box is perfect. Best bento box ever - well design and well made! This product is well designed and sturdy. I am very pleased with the quality and it's great that it packs down into itself for storage - as I have two now, and rather limited space. I find the Minimal to be an excellent sized lunch box for my work lunches. I usually put a big green salad in the bottom, and put meat or cheese on the top. Sometimes, I have a full-sized sandwich, cut in half, fits perfectly in the bottom section. Then I'll put some chips and veggies on the top. Or pasta salad on the bottom, and green salad and some chopped veggies go on top. There are so many possibilities! 1) This entire thing is microwave and dishwasher safe, YAY! 2) It fits true portion sizes. I am actively trying to eat better, and focus on whole foods, and I appreciate the limitations presented by Minimal. I bought these mainly for my husband's lunches. I was tired of using rubbermaid tupperware which was starting to show a lot of wear. And I wanted him to have something classy looking and practical too, so I purchased this bento box. It's the perfect size for my needs. In the top tier I place snacks and in the bottom one goes his actual lunch. It's nice to have that separation but yet everything is neatly together. Some of his colleagues have noticed the new boxes and were curious about it. They've held up great so far: easy to clean, no lingering food odors and the included cutlery is very useful. I'm so happy I found these, and the matching carrying case. Great product with good design! This thing is AWESOME, I use both or sometimes just one of the containers to bring my lunch to work, and is very convenient with the included knife~spoon~fork. At lunch, just pop the air plug from the lid, put in in the microwave and enjoy, as simple as that. It's also very easy to wash either by hand or to your dish washer. I really enjoy the bento box. I like how light it is for transportation, easy to clean, and save a lot of space when done with lunch or organizing it. I use it for my husband and for my kid every day. The Bento lunch box is perfect for a person that needs to have meals prepared and ready on the go. I love that it has two separate compartments to keep the different foods. I can have a salad in one and a main dish in the other. Having the knife and fork right with the container a bonus as I now use it daily and pack for snacks in the car and also veggies to be not only economical but to ensure I am eating well. I will be buying another box for My niece as she has started a new job, and needs to be able to eat at her desk or once spring happens, in the park. I am very pleased with my purchase and also how easy it is to wash up. Love Love this lunchbox! Golden 5 stars for sure! The perfect bento box in my opinion - I really enjoy mine. It's cute and easy to assemble. It's worth it, worth the buy.